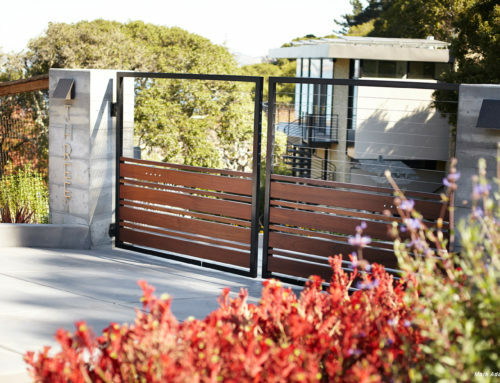 A steep hillside garden in Mill Valley required creativity to create outdoor rooms on a steep slope. We created several terraces, linked by broad, easy-to-navigate steps. An outdoor kitchen and dining terrace was created as the first level descending from the house, for convenience and easy access. 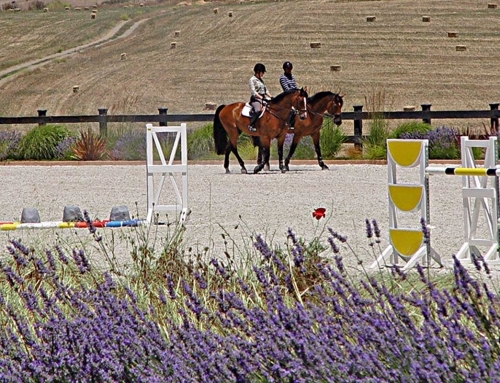 It is also the largest level area and encompasses a small lawn area and tether ball court for children’s’ play. 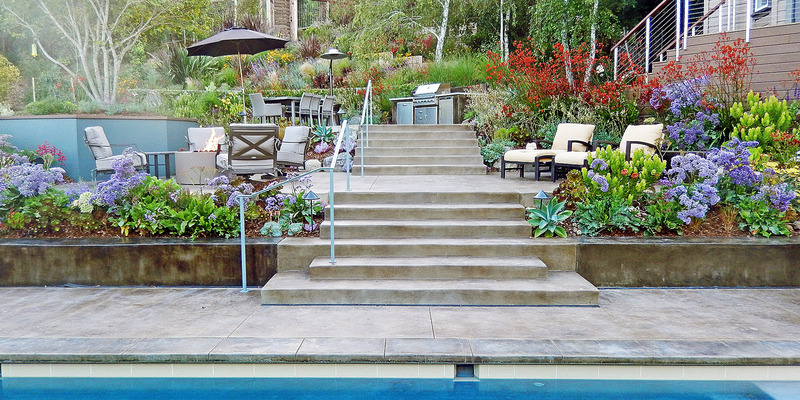 Descending a little further, is a fire pit and intimate seating terrace. The ultimate destination is a large swimming pool, complete with built-in spa and outdoor television, and with generous patio spaces at each end of the pool. It is linked to an existing bocce ball court by another flight of steps. A ramped swath of no-mow grass links the pool area back to the play lawn and acts as fast access for playing children to run between the lawn and the pool. An important part of the design was to create screening of the yard from a busy street immediately below the pool. 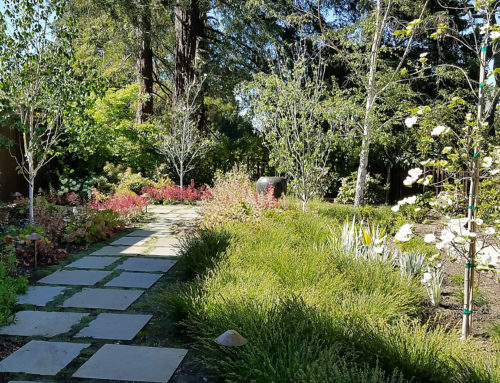 This was accomplished with a dense planting of native trees (Madrones and Strawberry trees) and tall shrubs (California Myrtle, California Lilac) and a lower layer of native Rockrose. 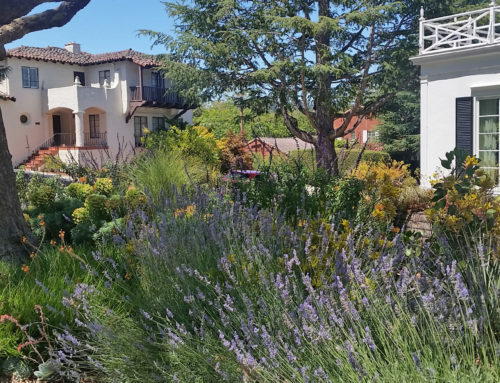 As we typically do, we created a plant palette of native, Mediterranean, South African and Australian plants and succulents to provide an interesting mix of heights, colors and textures that provide interest year-round, and that will thrive in this hillside garden. 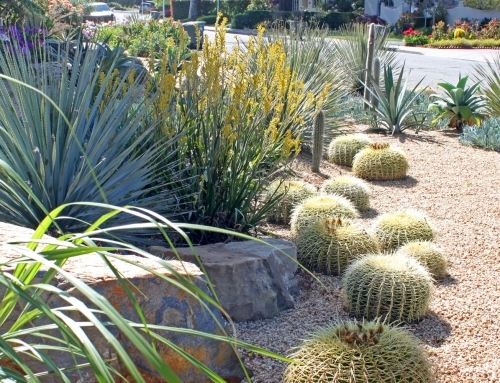 The plants all have similarly low water and maintenance requirements. The paving and walls are concrete, stained a rich, walnut brown, with the walls being darker than the paving for differentiation and to accent the planting. A last minute decision to save a beloved Magnolia tree resulted in the construction of a thin steel wall that wraps the tree. Steel is also incorporated into the wall housing the television by the pool, to provide an alcove to tuck the tv into when not in use.